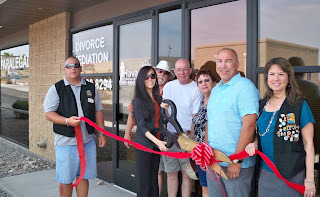 The Lake Havasu Area Chamber Ambassadors held a ribbon cutting ceremony for Havasu Paralegal & Mediation celebrating its grand opening. Attending the ribbon cutting from left to right were Denis Weuve, Yvonne Gutierrez, Tedd Alvies, Phil Seltzer, Kathy Seltzer, Michael Logan, and Amy Sugamele. Havasu Paralegal & Mediation is a legal document preparation service specializing in divorce, bankruptcy, and other uncontested legal matters. For more information contact them at 928-680-8294.